I know, I can hear the groans of misery flowing back at me through the internet. Everyone hates math with a passion. But, disdain for math has put consumers at a disadvantage when understanding what they are buying. I want to shine a light on some simple tools you can use to understand what you are being presented. How are we at a disadvantage? Consumers who do not understand what they are buying are more likely to overpay, over indulge, or be mislead by what they think they understand when they are presented with “50% fewer calories” logos or misleading “99% fat-free” stamps. We are constantly “snowed” by numbers that we are not certain are meaningful. October Unprocessed is about making choices with our food that lead to a healthier lifestyle. But, we all know in the modern world, choosing unprocessed is often difficult to do with every meal. With that in mind, this article is intended to give you some perspective about what food labels tell you about what you are eating when you choose something that requires a nutritional content label. First, you must do some math. Not very high level stuff, but material you should have encountered somewhere in junior high school. If you don’t remember things like percent and division and word problems, this topic should spur you into at least refreshing your skills. None of the math involved exceeds the capabilities of the most basic calculator that has a division button. When you see something has calories in it, what does that mean to you? To me, it means there is a measurable amount of material contained in whatever it is I am eating that my body can turn into energy. If you figure out how many grams of useable stuff there is in food, and then compare that to the total number of grams in the serving, you can even get a good idea how much of what you eat is just water, or other non-caloric stuff that happens to reside in food. As we all should know, caloric material comes as fat, carbohydrates, and protein. With that in mind, when you see a label that says “99%” fat-free, what does that mean to your diet when it comes to the caloric distribution? 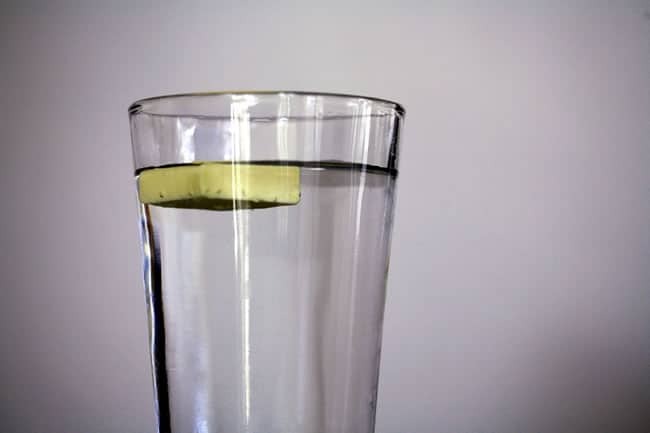 Let’s do a thought experiment – let’s say we fill a pint glass with water, or about 16 ounces. This turns out to be about 500 mL, which weighs 500 grams. If we spill out 5 mL of the water, I’d have 495 grams of water left. Now, foolishly enough, add 5 grams of butter to that glass. Delicious. Let’s examine the calories that are in the glass: how many calories are from carbohydrates, fat, and protein? First, the number of calories in water is zero. Everyone should know this, but it appears from the advertisements for “fat-free, gluten-free, calorie-free, sodium-free” water that the people trying to sell us their wares think people are not aware of this fact. Let me reassure you, dear reader, there are no calories in water. Feel free to look it up on caloriecount.com to keep me honest! Butter contains 36 calories for each 5 gram serving. Of that 5 gram serving, about 4 grams are fat. There are 9 calories per gram of fat, so it’s easy to see the 36 calories in butter all come from fat and nothing else. It doesn’t say it in the label, but the rest of the mass in the serving is likely water, as not all the water comes out of butter in processing. 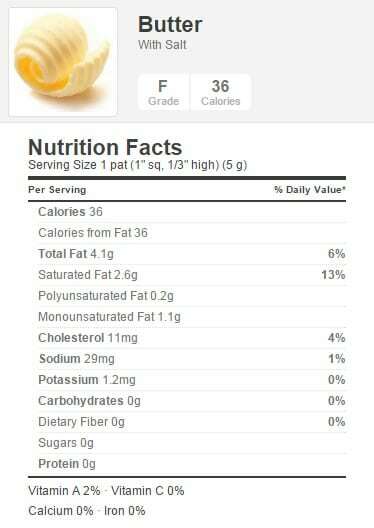 How many calories from fat is the butter? If we have 36 in the entire serving, and 36 comes from fat, the answer is 36 divided by 36 which equals 1.00, or 100%. That, of course, sounds terrible. 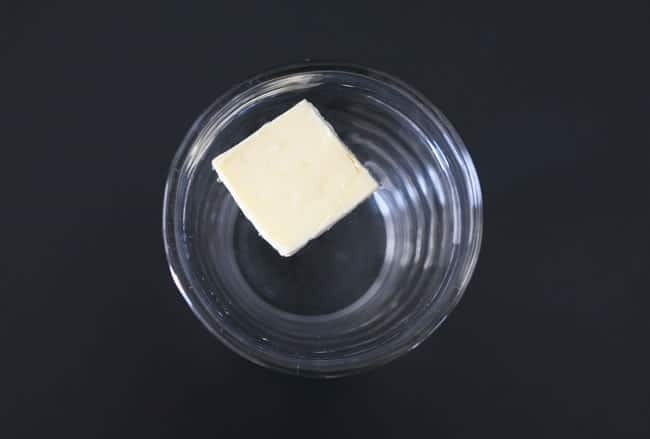 But, if I am a sharp advertising executive, I might instead tell you that the pat of butter is actually served in a glass of water, 495 grams of calorie-free, thirst-quenching deliciousness. Now, what I can do instead of letting the dear consumer think about that 100% calorie-from-fat butter, is to point out how many grams of fat reside as a percentage of the weight of the water-butter combination. So, here’s that math – 5 grams of fat divided by the number of grams in the glass (495 g water and 5 g butter) or 5/500, or 0.01, which is 1%. 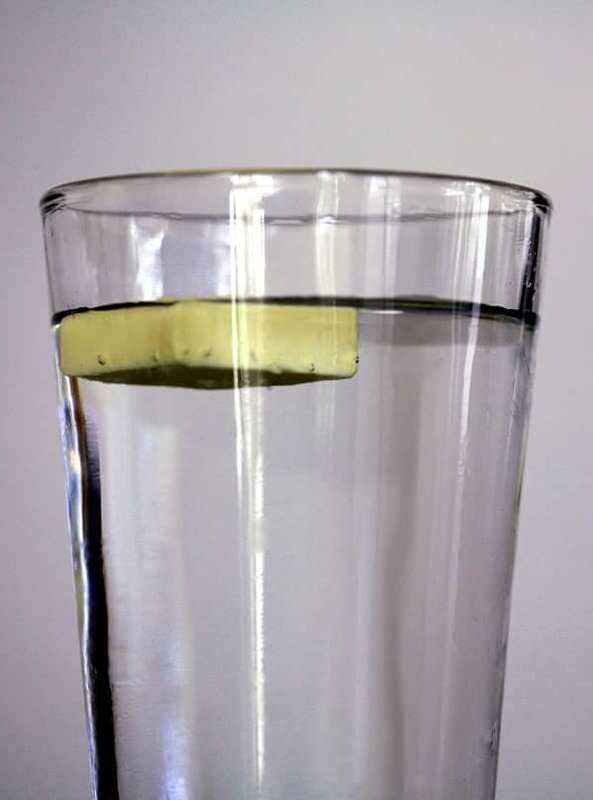 If 1% of the glass is fat, the other 99% must be fat-free, so you can now legally, and truthfully, say on your “food” that the glass of water-butter is 99% fat-free. The difference in the two percentages is that one is in weight-percent and the other is in calorie-percent. The person trying to sell you the glass of butter-water wants you to focus on the one that, according to advertising surveys, “sounds more healthy” to you. Weight percent is useful to marketers, but consumers need to understand calorie percent. The point of all of this math and rambling is to get readers to dig into what they are being presented. What I just outlined about butter is true and honest and ethical to advertise. The seller, who is biased by the desire for you to buy the (hopefully imaginary) butter-water product, wants you to see numbers that make you think you are making a healthful purchase. By presenting numbers that are a reasonable weight percent of fat, the seller hopes you might bypass the simple math required to understand what is in the package. When I talk to people about numbers, they commonly throw out “numbers lie” or “statistics lie,” and I am always disappointed. Numbers don’t lie. Not understanding what the numbers are telling you is what a “liar” is taking advantage of in order to get you to do something to his or her benefit. In the case of food, the basic math described here gives you an opportunity to exercise diligence in understanding what you are considering putting in your mouth. Eric Cline, MS is a geoscientist in the Houston area and is always looking for numbers to interrogate. He most commonly writes on compelling topics like geomechanics, petrophysics, geophysics, and structural geology (so do not look for a food blog to follow!). He enjoys eating well, restoring old cars, and quality time with good friends. Thank you, very informative. I thought I was fairly nutrition savvy but was totally overlooking this. Fantastic, truthful, and much-needed article to get out there. Society as a whole puts far too much trust on what other people tell them, whether it be how healthy the packaged food is or whether to buy that new designer sweater. We need to step back, take a breath, and see the whole picture: whatever is on the package is there to encourage us to buy it, not to tell us whether the product is sincerely something beneficial for our own individual selves. Eric, great explanation!!!!! You used a simple combination to explain how the numbers can appear something they are not. Thank you for your thoughtful writing. Whole Milk = 152 calories, 8g fat, 12g carb, 8g protein = 47% fat cals, 32% carb cals, 21% protein cals.